Ingenious design allows the Orbiter to fit in small ceiling spaces. 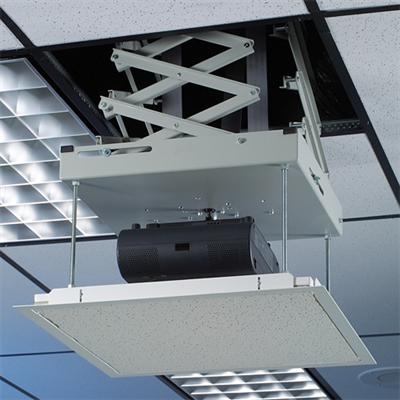 It is the only lift that can be installed in an angled ceiling or wall, making it uniquely versatile. The lift conceals the projector and quickly rotates it into the “show” position at the touch of a switch or wireless transmitter. 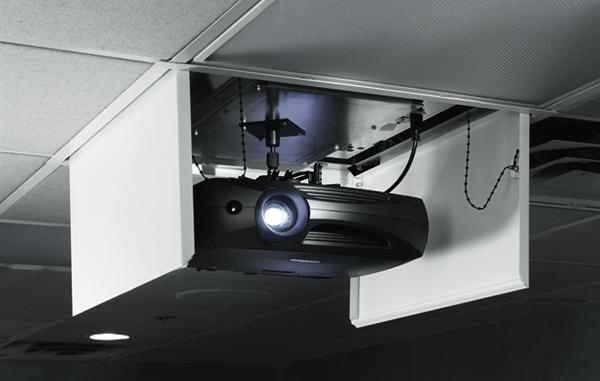 The Orbiter is supplied with a universal-style bracket that allows for easy attachment of a variety of projector models. The Orbiter can also be used for video conferencing cameras, speakers, etc. The Orbiter can be operated by optional IR or RF remote control, standard wall switch, or integrated into your controlsystem. The Orbiter motor is a DC–low voltage motor, 12V,which allows for easier control and wiring of the lift. Wall switch included. Options • Environmental Airspace Housing—Aluminium housing isolates projector from environmental airspace above ceiling. • Angled Ceiling Adapter—for mounting on angled ceilings or walls. • DC Motor Control—included as standard. Required for IR / RF / Serial / Network / Commannder Control System™. 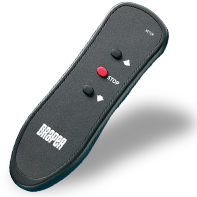 • Control Options— Commander Control System™/ RF/ IR remote/ Wall Switch. Three models to lift up to 11, 23 or 68 kg. AeroLifts install in even the tightest spots, and offer a different look thantraditional scissor lifts. 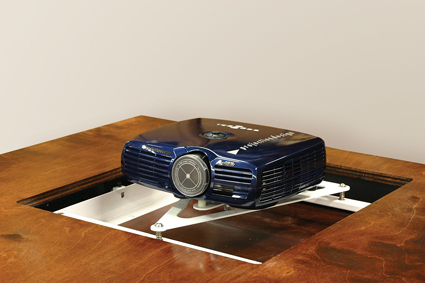 Use AeroLift to conceal projectors, speakers, or cameras. All three models are powered by strong tubular motors for a simplified design, and feature a stabilizing arm which can be used for cable management. Built-in adjustability allows you to deal with job site conditions quickly and easily, like slightly out of square or irregularly spaced joists. 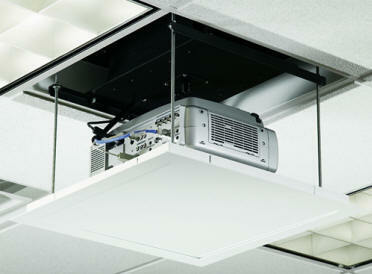 Projector can bemounted flush to bottom pan or use optional UniversalProjector Mount. Options • Environmental Airspace Housing—Aluminium housingisolates projector and lift from environmental airspace above the ceiling. • Ceiling Closure Panel—Universal ceiling closure in a white finish or recessed to accept ceiling tile. Shown in photo at left. • Ceiling Finish Kit—Ceiling closure panel and ceiling trim ring to finish ceiling opening. • Universal Projector Mount—Provides secure and simplemounting for most projectors up to 12kg. See page 6. • Control Options— Commander Control System™/ RF/ IR remote/ Wall Switch. Bomb bay doors and a slim cross-section distinguish the LCD Lift. 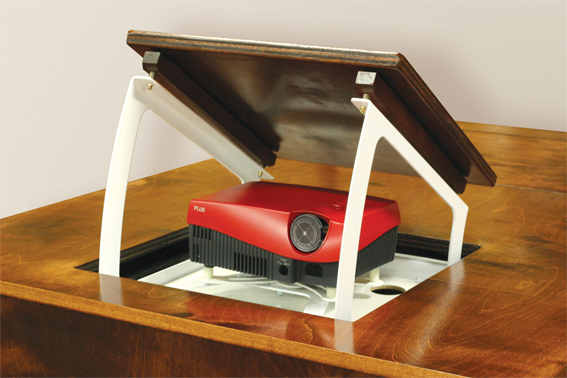 Most popular LCD and DLP projectors fit comfortablyinside this unit, which is available in two sizes—Model A and Model B. Bomb bay style closure doors are standard. Environmental Air Space Housing of aluminium, with closure doors finished in white, is standard. 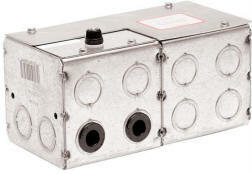 Contains internalswitched duplex receptacle, 220V AC, which is powered when the unit is fully down. The LCD Lift contains an innovative current sensor that delays closing of the unit until the projector lamp has shut off. Lifting capacity 30 kg. Options • Ceiling Closure Panel—Flat ceiling closure in a white bakedenamel finish or recessed to accept ceiling tile. 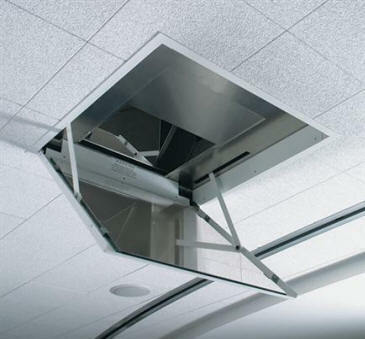 • Ceiling Access Door—A 60 cm x 60 cm hinged door to access lift above a finished ceiling for cleaning, maintenance or repairs without having to damage the ceiling. Available with a white painted finish or recessed to accept ceiling tile. • Factory-Installed Cables—for RGBHV, Video and Control.• Universal Projector Mount—Provides secure and simple mounting for most projectors up to 12kg. See page 6. • Control Options— Commander Control System™/ RF/ IR remote/ Wall Switch. The totally unique Phantom quickly and quietly dips the projector out of the ceiling and into the “show” position at thetouch of a switch or wireless transmitter. The Phantom can also be used for videoconferencing cameras, speakers, etc.The projector is mounted above the ceiling or in a tabletop. When activated, a trapdoor brings the projector into your room using a precision actuator with preset limits. 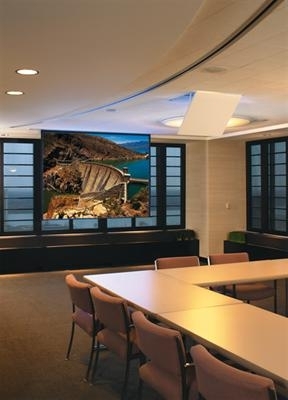 The projector is easily aligned during installation to provide a direct light path onto your Draper® projection screen. 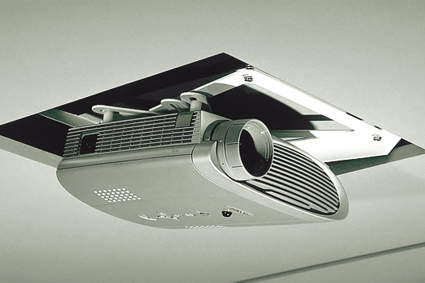 The Phantom is supplied with a universal-style bracket that allows for easy attachment of a variety of projector models. Two Phantom models fit most projectors up to 12 kg. The Phantom motor is a 24V DC low voltage motor, which allows for easier control and wiring of the lift. Wall switch included. 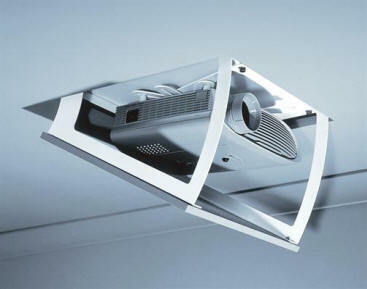 Options • Environmental Airspace Housing—Aluminium housing isolates projector from environmental airspace above ceiling. • Ceiling Access Door—for easier access after installation. • DC Motor Control—included as standard. 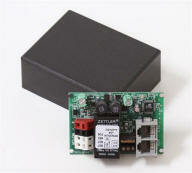 Required for IR / RF / Serial / Network / Commannder Control System™. 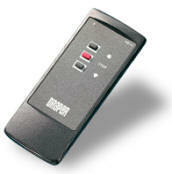 • Control Options— Commander Control System™/ RF/ IR remote/ Wall Switch. Il presente listino sostituisce ed annulla ogni precedente.I prezzi indicati si riferiscono a singolo diffusore.